It’s nice to have a partner in the kitchen. Howard is a great helper, but, more important, he does a great job on his own when he’s the chef. He makes our breakfast every morning. It’s something simple during the week, usually just toast and fruit. On weekends, it’s more elaborate: eggs in many styles, pancakes, waffles. As a trained scientist, Howard comes up with his own kitchen experiments. Some time, I’ll tell you about his sous vide setup (assembled from parts purchased on eBay). This week, he worked on perfecting Chinese pickles. These were inspired by a garnish on the entrees at Baumgart’s, a place we ate with Howard’s family in New Jersey. The garnish was pickled broccoli stems. They were tasty. Howard made similar pickles with the stems from our CSA broccoli plus carrots and daikon (also from the CSA share). Prepare the vegetables. For broccoli stems and daikon, peel, quarter lengthwise, then slice thinly. Carrots can be treated the same, but don’t need to be quartered. Radishes can just be sliced. Turnips probably need to be quartered, depending on the width. 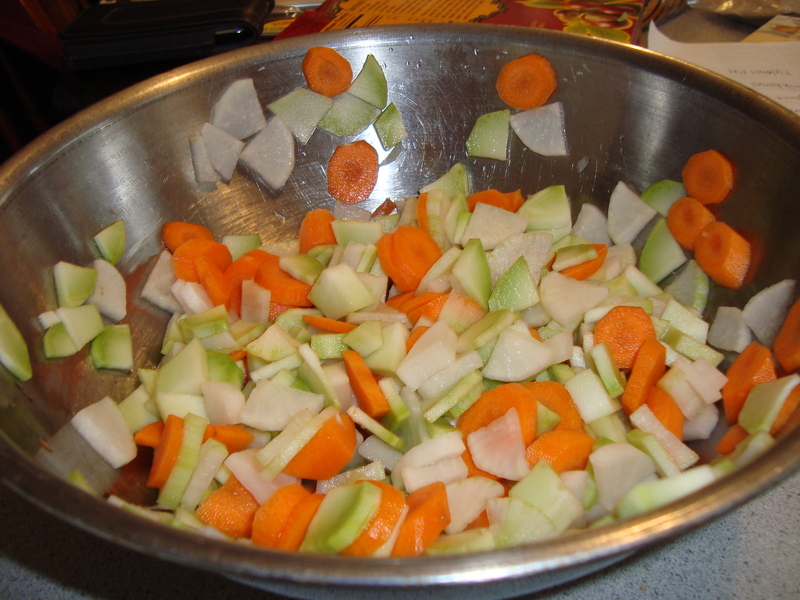 Place the vegetables in a bowl and sprinkle with salt. Let it sit for 2 hours. Rinse off the salt and drain. To make the brine, combine vinegar and sugar until the sugar dissolves. Add ginger. Put the vegetables in a clear jar big enough to hold them. Pour the brine over the vegetables to cover. Store in the refrigerator. Wait overnight or longer before eating them. Posted on 24 November 2009, in Winter CSA and tagged broccoli, carrots, daikon, pickles. Bookmark the permalink. Leave a comment.